Flatcoat Retriever photogravure from The Sportsman's Calendar published by The Berlin Photographic Company after Maud Alice Earl (English, 1864-1943). 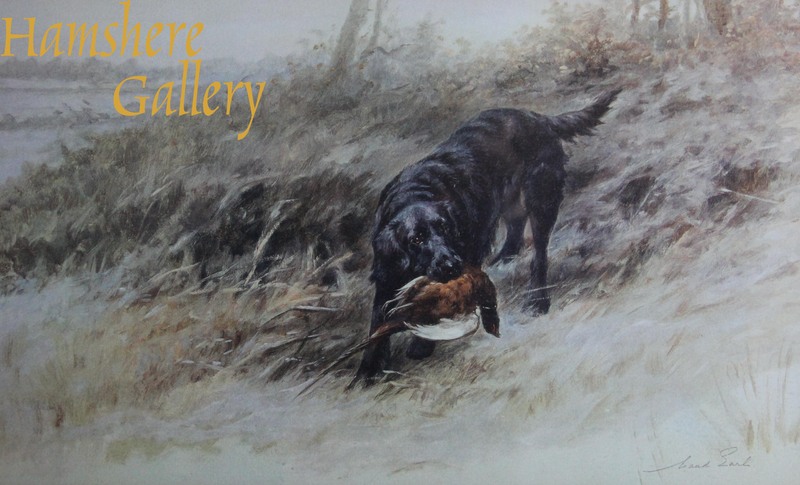 “December - "Tender and True ... Retriever" a photogravure of a Flatcoat retriever, published 1906, as part of The Sportsman's Calendar by The Berlin Photographic Company after the painting by Maud Alice Earl (English, 1864-1943 The Sportsman's Calendar featured twelve of Maud Earl's works, January - "A Check .... Beagles"; February - "... Spaniel"; March - "Nipped in the Bud - Wire-Haired Terrier"; April - "Raw Material - Welsh Springer Puppies"; May - "Visiting The Coops - Ilchester Retriever"; June - "The Long Vacation - Foxhounds"; July - "Near The Holt - Otterhounds"; August - "The Twelfth ... Setter"; September - "Brace-Work ... Pointers"; October - "A Busy Team ... Cockers"; November - "Full Cry ... Foxhounds"; December - "Tender and True ... Retriever". “Tender and True” was later illustrated for The Illustrated Sporting and Dramatic News of 16th October 1909. English, 1906. The Sportsman's Calendar edition was limited to just 100 sets, each signed by Maud Earl, and came in a case designed so that a different photogravure could be displayed for one month of the year.